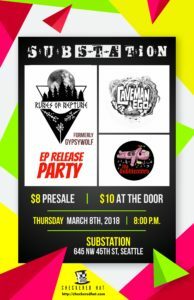 We are proud to be hosting the Runes of Neptune (formerly GypsyWolf) EP release show Thursday, March 8th, at Substation in Ballard. The band formerly known as GypsyWolf has now transcended into The Runes Of Neptune. Coming from the heart of Washington State, the Runes bring together a unique blend of psychedelic rock, funk, soul, hip-hop, and Improvisational jams complete with original freestyle flow tastefully incorporated into every performance. With a wild groove and the spirit of the Northwest beating in their chests, the Runes take you on a journey through the landscape and lifestyle of Cascadia over a myriad of different musical genres and styles, textures and rhythms. Only experiencing a live show can captivate the true essence of Runes Of Neptune, the most funktastic groove makers this side of the cosmos. The Bubbleators take their name after the iconic bubble-shaped hydraulic passenger elevator presented during the 1962 World’s Fair which had the sole purpose of visually offering a different perspective on the world from the inside out though the refraction of light. The four members of the group, The Bubbleators also offer a different perspective in auditory sound through the refraction of culture, emotion and soul. This culmination results in an aggressive slap to the face bearing grooves and melodies you cannot escape. The Bubbleators are Matt Brooks/vocals/guitar, Davy Nefos/drums, Reign King/bass, and Josh Richins/guitar. Don’t miss out on this opportunity to see this eclectic mix of cosmic, caveman and just plain weird!